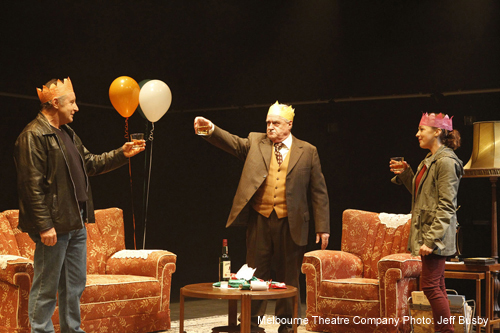 From a beer-hazy summer in a Carlton boarding-house to the wine on the dinner table of an erudite English family, Season 2012 has already seen plenty in the way of onstage inebriation. 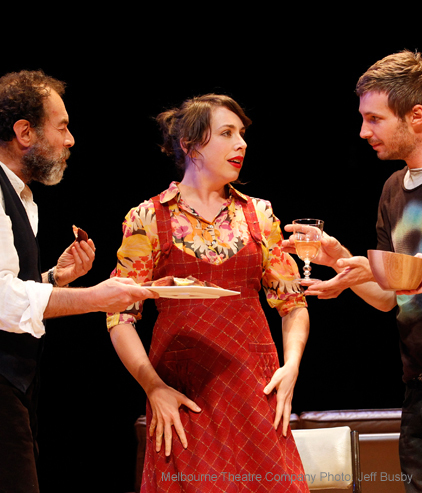 Watching talented actors performing drunkenness, from the tipsy to the rampant, you’d be forgiven for wondering if those were really just prop drinks in their hands. Rest assured, these are consummate professionals, consuming only the fake stuff. The MTC Stage Management crew were happy to divulge their trade secrets, no plying necessary. Here are their suggestions for the making of fake booze. For white wine, a simple drop of yellow food colouring in water does the trick. Slightly more exotic, red wine can be substituted with blackcurrant or grape juice, plus a dash of blue food colouring. Non-alcoholic beer can be found at the supermarket, otherwise sparkling apple juice is a convincing alternative. Champagne is a tricky one as it can require a ‘pop’ – this problem is solved by using unopened bottles of sparkling grape juice. Although, if a bottle-opening moment is not required, flutes of soda water with a dash of lime juice can be just as believable as the real thing. With a play featuring a tyrannical Irish grandfather, The Seed, opening this week at the Fairfax, we’d be remiss not to mention whiskey. While the expressions on the actors’ faces may have you convinced they’re drinking down some truly fiery stuff, our sources tell us it is likely to be cold tea or apple juice, or even watered-down cola cordial, in those glasses. There are no hard and fast rules to concocting stage drinks, but while different Stage Managers may have their own methods, there are a couple of things they always need to keep in mind. Crucially, nothing too sugary or caffeinated should go into a fake drink as this could dry out an actor’s throat. And of course it is the duty of any responsible mixologist to ask the cast what they’d prefer. After all, they’re the ones who’ll be drinking the stuff night after night.